Mango cultivators of Chittoor in Andhra Pradesh’s Rayalseema region have been badly affected this season. The prices of the king of fruits have crashed in the district, which along with the bordering areas of Nellore and Kadapa, is a major global mango producing region. Most farmers here grow the totapuri variety, which has high demand in the international market for its pulp. According to the horticulture department officials, the estimated yield this year is about 40 per cent less as a result of unseasonal rains. But more than the low produce, what’s worrying farmers is that pulp industries are not receptive in lifting stocks. Distressed cultivators, many of whom ditched other crops in favour of mango due to surging interest in horticulture and government subsidy, have hit the streets and at many places dumped their produce on the roads to protest against prices dipping as low as Rs 4.5 for a kg. This has come as a shocker as in the month of May this year, mangoes sold at Rs 12 a kg, and last year, the prices stood at Rs 20 per kg. To tide over the crisis, Chief Minister N Chandrababu Naidu announced in the first week of July that pulp-making industries would have to pay a minimum support price of Rs 7.50 per kg to the mango growers, out of which the government will offer Rs 2.50 directly to the farmers. The move has brought cheer to about 60,000 farmers. Pulp factory owners have also been asked to lift produce from the district and not take orders from outside. 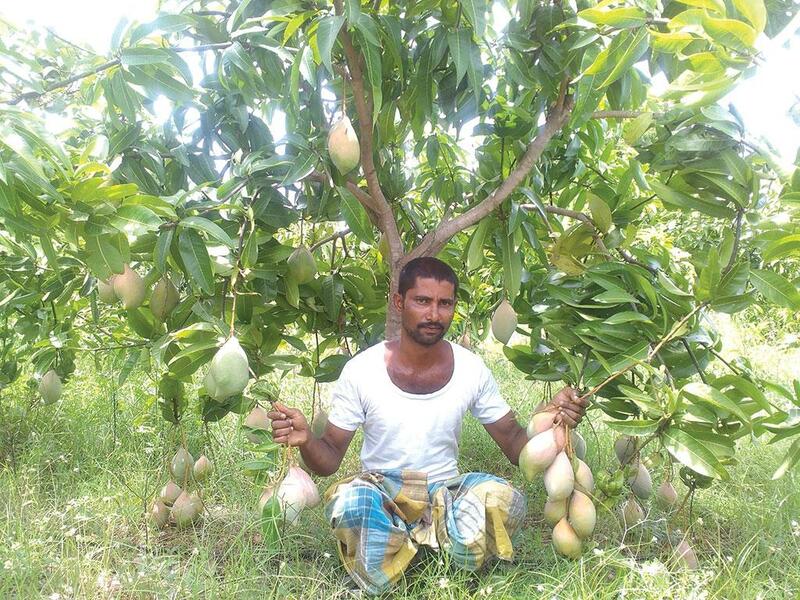 The problem is acute as totapuri, often referred to as the Bangalsora variety, dominates 50 per cent of the acreage under mango cultivation, acccording to statistics available with the district administration as of 2017-18. Explaining the situation, S J Anil Kumar, a trader at the Chittoor market yard and owner of Sri Manjunatha Foods—a pulp manufacturing unit at Maddipatlapalli—says, “Our orders are only 25 per cent of last year. The conflict in Yemen is playing a major role behind falling exports of pulp. Our old stock is lying idle. Yemen is one of the top importers in West Asia, along with Saudi Arabia, Kuwait and the United Arab Emirates. Also, the crop coming from Krishnagiri in Tamil Nadu and Srinivasapuram in Karnataka has led to this sudden fall in demand.” Similar is the story with almost all the 42 pulp producing units. Agents and farmer leaders say that a combination of factors have contributed to the glut in the Chittoor mango market this year. “There is increasing acreage under mangoes across the rest of India, especially in Uttar Pradesh, Gujarat, Odisha and Maharashtra. There is also lack of sufficient purchasers from outside the state leading to a surplus,” says Y Yashwant Rao, the secretary of Tiruchanur market yard. Sadly, this is not the first time when Chittoor’s mango market prices have slumped. In 2005 too, mango production had dipped by 20 per cent compared to the last season. Cola-Cola’s withdrawal from the market is also responsible for the crisis. Once a major buyer of mango pulp for its fruit drink Maaza, the company has now stopped procuring mangoes from the farmers. It now buys pulp from agricultural products maker Jain Irrigation Systems, according to Mangati Gopal Reddy, the president of the Andhra Pradesh chapter of the Federation of Farmers’ Associations. “No doubt, a big purchaser going out of the market will have an impact on the prices,” he says. The only special economic zone set up in the district with 75 per cent central assistance and 25 per cent private participation, the Srini Food Park, has also not procured locally, he adds. Chittoor also lacks cold storage facilities. Owing to the lack of this, mango farmers take their produce to the factory gates and sometimes wait for 48 hours. Farmers Down To Earth spoke to pointed out that this added to their cost, as many of them do not own tractors and hire them on a per day basis. Often, mangoes overripen during this time. Currently, mango orchards are spread over 70,000 hectares in the district. But after the distress situation, farmers are thinking of abandoning mango cultivation. Chittoor’s mango growers are vulnerable to price volatility and weather variability even though the government is helping farmers by providing a subsidy of Rs 35,000 per 0.4 hectares over a five-year period. Its efforts are evident from the fact that the area under mango cultivation has increased by 30 per cent over the past 10 years. According to reports, the state is planning to bring more areas under horticulture, especially mangoes. Offering a solution, K M Yuvraj, professor at the Acharya N G Ranga Agricultural University in Tirupati, says that diversification of horticultural crops can solve this present crisis as farmers now economically depend on mango cultivation only. The state government should also promote totapuri just like the alphonso and declare a minimum support price for the fruit, Yuvraj says. Often unfavourable statements deepen the crisis. Recently, industries minister N Amarnath Reddy said he had to sell his own produce at Rs 5 a kg when confronted with queries on low prices. “This served as an excuse for the pulp manufacturers, who are not keen to increase prices,” explains Reddy. Chittoor is drought-prone. Faced with water shortage, many farmers turned to mangoes expecting rich dividends. But the present crisis has left them with a sour taste. (This article was first published in the 1-15th August issue of Down To Earth under the headline 'Not a sweet bargain').